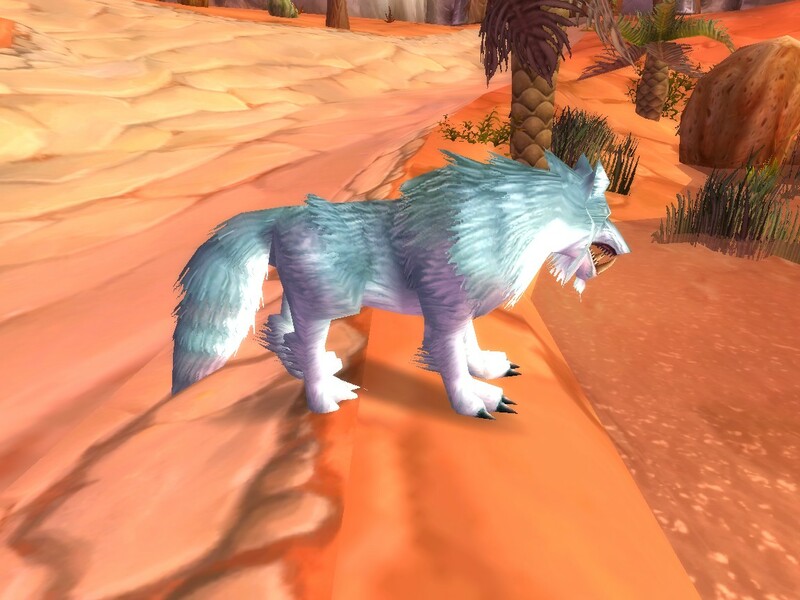 Same skin and colour as the other wolves, but noticably larger in size. Can spawn along with the other wolves at any point along the north river bank of Duskwood. What's his spawn time, anyway? I've been looking for him for a couple of days on Azgalor and I can't find him. Found him in about 10 minutes or searching to the north east of raven hill cemetary. Still does shadow damage. Will keep around for a while and see if the sahdow damage stays after 1.9 patch. Impossible to find. People who found him = Luckiest people in the world. If you ask me blizz is nerfing alot of pets, why? Is it to make other pets look better? Is it to upset the players?whats the point in trying to find a good pet if theyre all nerfed?You may as well just grab a pet you would have normally killed thinking all the pets are alike besides their lookks. sure bears ahve more armor and cats have goood dps. but really, I think blizz should stick with the special moves for these pets instead of dissapointing everyone who has them. I can't seem to find him on the Kil'Jaeden server.... If any would mind helping me out that'd be nice. My friend got him in 6 hours, but I'd rather not look that long. Sooo, any help is appreciated. Ok, people say that he only spawns in twilight grove, yet on the map on here, it says he can can spawn in behind the Raven Hill cemetary and even in barrens! I gave up on trying to find him about a week ago, but i would really like to know for the record why he was so god damned hard to find! So does anyone know where he spawns for sure? because i have learned notto trust the maps on here entirely. i have seen Lupos like 2 times the latest 2 days.. and both of the times he have been killed right infront of me.. that pisses me of..
but does anyone know if Lupos shows on the minimap when you have "track beasts" acivated? 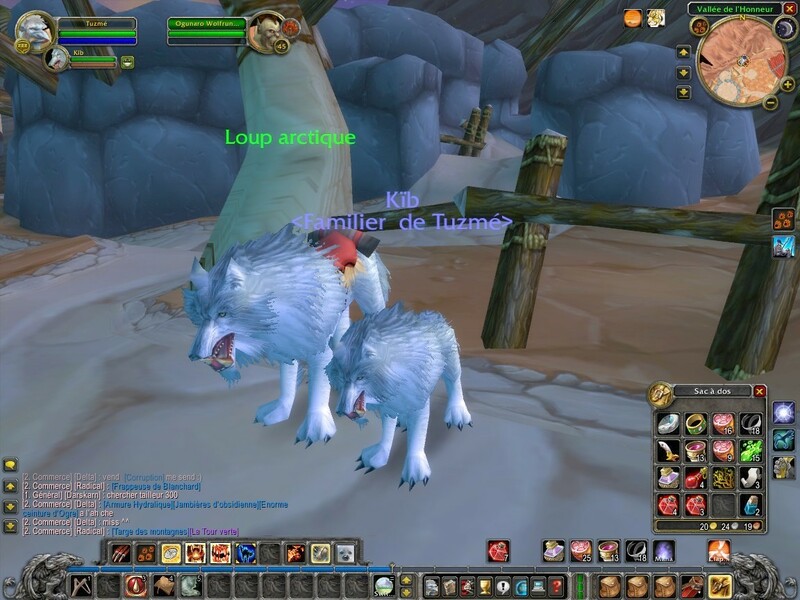 i just found lupos =) and succeded in taming him.. i found him at 60.25 in duskwood..
Was looking for Lupos and using macro as I ran around from Ravenhill back to road and all of a sudden he popped up on target. I had my good pet (Humar, so had to run to stable fast and swap out to raptor. Luckily he was still right where he was (37,28) when I first saw him and noone else had came by. Dismissed raptor, set ice trap, concussion shot, started taming and he was mine. What a powerful pet with the extra shadow damage. I sure hope they don't nerf it in 1.9 patch. It takes less than an hour of not feeding your new pet for it to abandon you. So his story could be true. About 12:30 pm server time. His exact location was 37,27... dunno if that is where he pops every time or not. My temporary pet attacked and almost killed him. I dismissed pet, let Lupos kill me, then ran back ASAP to tame him. Concussion shot and freezing trap and he was mine. Was on my way to the Brightwood Grove to tame a wolf to learn bite 4 - from Raven Hill Cemetary along the Darkend Bank. when l got to the east side of Darkend bank where Brightwood Grove starts, l got attacked by a silver wolf, didnt think nothing of it and kept running, trying to avoid it, when l noticed it was Lupos. So decided to tame it. Had to run a fair distance to lose its agro by which time l had died from other mobs. then spent another 30mins avoiding mobs trying to track him down. Tamed easily with a frost trap in place. 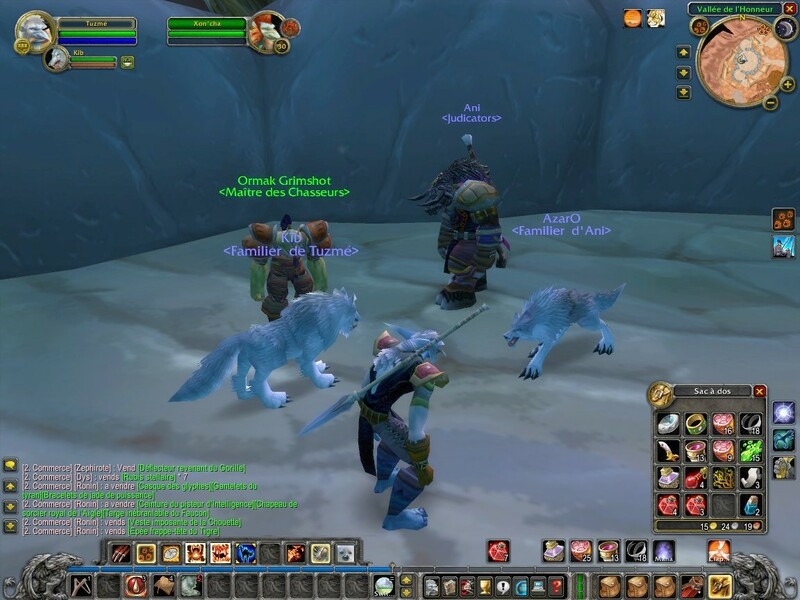 PS if any hunters want info on pets then check this site out.Has everything a hunter needs to know about pets, AS, DPS, Diet etc etc as well as all locations of where to find everything including all pet skills. Killed him and got the staff. Since the confirmation of his shadow damage, he's been more and more hunted. 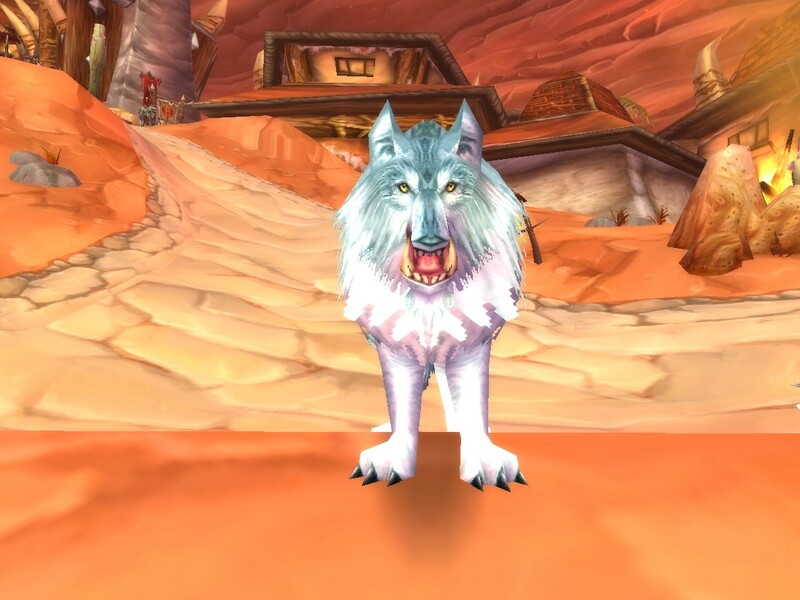 Luckily I grabbed him early just so I could have a frostwolf lookalike...little did I know that he would change my entire PvP strategy! At level 53, he can almost defeat level 55 warriors in one-on-one combat...with no healing from me. "That dog is tough as nails!" - actual quote from a warrior on my server. Shreds through warriors and paladins who ignore him because they think he's just another Frostwolf. Can either be BM'd out, or combined with a MM/SV build for truly devastating duo damage. Still, slow attack speed (2.0) makes him just standard against cloth wearers. 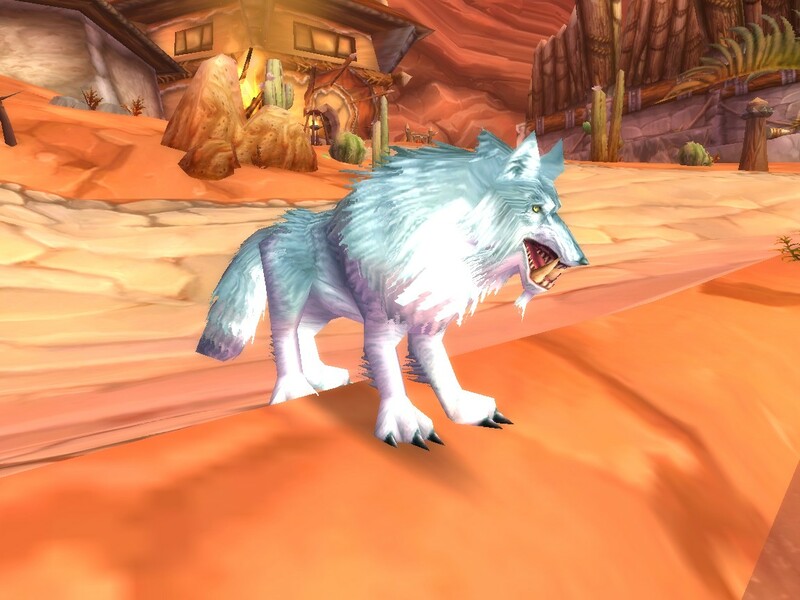 All in all, he is a great soloing and PvP pet, but I still use a Frostwolf on raids. And if Blizz nerfs him, I swear to god I will quit my account. They're already standardizing our pets too much! Found this guy at around 2am just to test out this shadow damage stuff and its true. Normal wolf stats with 2.0 attack speed (1.54 Frenzy) and a slow-medium pursuit speed. He just looks like a standard white wolf and he doesn't glow. does the shadow damage really make it al that much better? I mean at high lvls wouldnt ppl have some shadow resistance, or do they think its just another frostwolf? Are there any other pets like this that are almost one of a kind/have special properties that make them more desirable? anyone know his attack speed? I found Lupos last night. He is very cool. How can you tell that he is dealing out shadow damage instead of normal? I have watched him closely and have not noticed anything different besides a different sound coming out of his hits. BTW, I named him MoonShine. Seemed fitting. Eaglesclaw. Azjol-Nerub Server. I've been waiting for him forever and still havent found him. Anyone know respawn time or if he looks any different thatn any of the other wolves around here? Found and tamed him northeast of Raven Hill, after 2 days of searching. Helps to set up a simple macro like /target Lupos. Then drag it to a hotkey and spam that as you run along the river. Use: Restores 552 health over 24 sec. Must remain seated while eating. If you spend at least 10 seconds eating you will become well fed and gain 6 Stamina and Spirit for 15 min. When the hunt was over and the campfire out, I had over 130 Seasoned Wolf Kabobs, and about 20 Gooey Spider Cakes. If you feel bad about feeding Lupos the kabobs (since he's a wolf), don't worry, he loves 'em! He looks a bit different but only in the size of his fangs. Other than that, hes is the same. does he still ingonere enemy AC? Getting nerfed in 1.9. Soon he will be a totally standard 2.0 speed white wolf which runs at 115%. Just like the AV Frostwolf, Timber, and countless other white wolves. Lost his shadow damage now, so after being tamed he's just a regular wolf. Killed him Once again hes easy to finde hes the biggest Wolf arround :D. dropped the nightbane staff . Anyone know his spawn times, where he spawns the most etc? Very nice cape of which my character still wears! i just cant find him. I have been looking for 3 days and i cant find him! * All hunter pets will now always deal Physical damage for their base attack. Lupos dropped Black Velvet Robes for me yesterday. Lucky or just not listed? Found him after waiting for about 2 and a half hours. 6:21 server time(PST) on the mountains directly east of Eliza's grave. Can't wait to test him. Lupos is a good pet but I'm not as impressed as I should be. Took me 3 days to get him, I didn't camp just checked his spawn spots every time I could. I still prefur the Strider Clutchmother, something about a big green bird following you is so much fun. I gess I'm just a sucker for looks. is where I found him. Plan on going back to kill another to try to get those boots. But if you want him..look where the map shows and make a macro /target lupos. OK i am at the place where Lupos spawns and in the bushes nxt to it i c 2 orange eyes is tht in his lair like waiting ot come out or wat? Less than 3 mins after I reached duskwood,I found it and got it. :EDIT: ran into Lupos twice since I first posted, both time he was nearly directly behind Eliza's Grave. First time I saw him, another hunter killed him just for his drop (kinda dumb considering he had a ravager worg from not far away). I missed Lupos's next spawn, but got him today. think he's on a 8-10hr loop. to me he looks slightly like a ghost. you losers are actualy gunna quiet your account over pet fix? biggest thing id like to say is, ROLL A WARLOCK! your making the rest of us hunters look bad. if you think youve got it bad, roll a warlock! I tried to find him for 3 long hours in a row, and finally got lucky. He was on the west side, near the "hill". I made a 23 ravager temporary pet there, to work my way through the pops, since I was lvl 23. There is plenty of "Lean Wolf Flanks" there to keep them happy. Beast Tracking proved to be quite useful also. He is NOT the same. He deals shadow damage that ignores armor. This NPC can be found in Duskwood (14).